Back long before I was pregnant I remember stumbling across this product line, coming from a technology background I am certainly all for gadgets that help you out. As far as I’m concerned this product certainly does that, I actually can’t believe someone didn’t come up with it sooner. 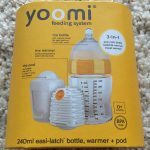 We already have the Tommee Tippee Perfect Prep Machine which I will be reviewing later but that doesn’t help when out of the house, I wanted something that meant I could easily go for a picnic and warm up formula without needing hot water. There are lots of ways to achieve this but I loved the whole idea of the Yoomi range and let me explain why. 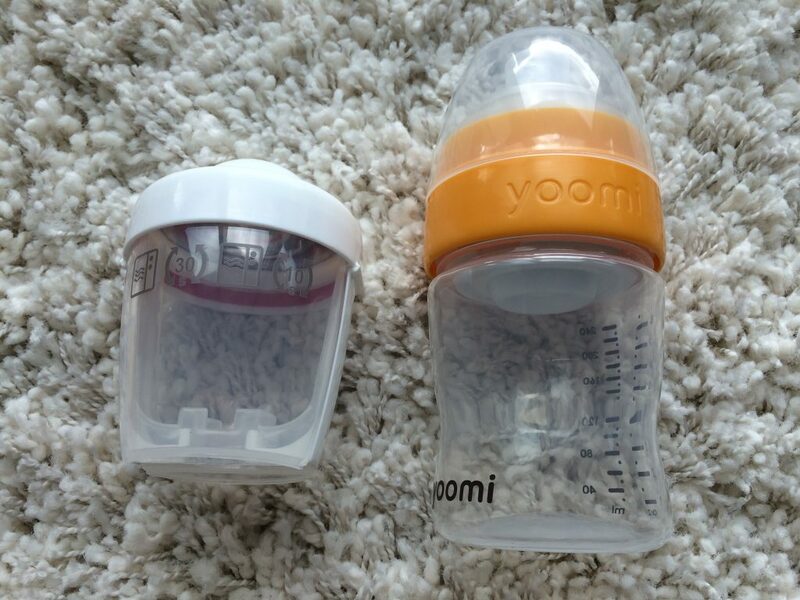 Yoomi do a full range, you could actually just use their bottles, as I mentioned before though we do have the prep machine so I purchased their 8 oz feeding system if you wanted to start with a smaller bottle they do a 5oz feeding system also. This set includes one 8oz (240ml) bottle, soft teat, warmer and the recharge pod which is perfect for occasional trips out exactly what I wanted it for. Before the we bought the prep machine I was going to buy a whole starter range from Yoomi however it makes much more sense for me to have the prep machine warming feeds at home and we have the space for it. The bottle has been designed with six anti colic vents within the teat which apparently has been designed to stop air bubbling through the teat and into the feed. You do have to buy their teats when you want to replace them, but they have a bunch of options for flow on their website and I don’t think they are that expensive given the convenience (2 pack for £4.50). First time setup is a tad more complicated as Yoomi give you what’s called a stage 1 time, but once you’ve done that there are only really a few steps to this bottle system. Now to charge the warmer you have two options, either you boil the warmer in a saucepan full of water or you can microwave the warmer in the charging pod. Microwaves vary to Yoomi get you to do a stage 1 setup, which stops you overcooking your warmer. Pop the warmer upside down in the charging pod, secure the arms down and place in the microwave. Heat for your stage 1 time (worked out above). Remove from the microwave and shake the pod for 30 seconds, pop the pod back in the microwave after. Heat for a final 30 seconds. 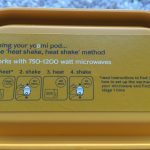 Remove from the microwave and shake the pod for 10 seconds, then let the warmer cool down for 75 minutes or pop in cold water for 20 minutes to cool before pressing the button. The important thing to remember is all these parts need sterilising as with all bottles, this includes the warmer. What you don’t want to do is use a microwave steriliser with the warmer because working out your charging time for your microwave is part of the initial setup and you do not want to overcook your warmer. So you can only sterilise the warmer in either an electric steriliser, cold water (with tablets) or in a saucepan of boiling water for four minutes. I have a microwave steriliser so I’ll be sterilising my warmer in a saucepan, every other part of the feeding system can be sterilisers in the microwave steriliser as normal. 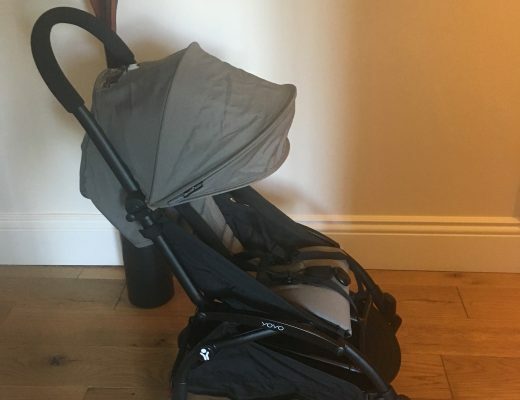 Once charged the warmer can be kept until you need to use it, so it makes for a quick and fast option for flinging into the changing bag (once sterilised). Speed – I like that the warmer is designed so that the milk flows down through to warm the feed, 60 seconds is pretty speedy! Connivence – If I can get a baby product which is going to make things easily for me then I am all for that product. Hygienic – Unlike other warmers, the Yoomi bottle keeps the feed cool until you want to warm it up. Where as other warmers keep the feed warm for several hours allowing bacteria to breed. You have to buy Yoomi teats, your baby may not get on with the Yoomi teat. Limited life of warmer, Yoomi quote around 150 charges before you need to replace your warmer.